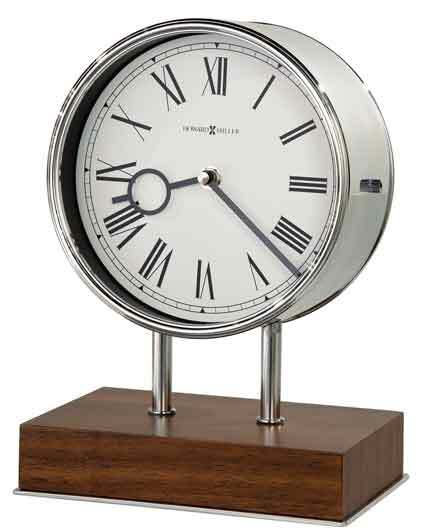 The Howard Miller Zoltan mantel clock features a wide polished chrome bezel which is 7.25" in diameter. It has a chrome metal bottom base and chrome posts, and a Walnut finished veneer wood base. The large, stationary white dial features black Roman numerals with black hour and minute hands. The Quartz, triple-chime Harmonic movement plays your choice of full Westminster or Ave Maria chimes with strike on the hour with 1/4, 1/2, 3/4 chimes accordingly. There is also the option of the Westminster chime and strike on the hour only; or Bim Bam chime on the hour only. It also has volume control and automatic nighttime chime shut-off option. The Quartz movement requires two C sized batteries. Size: Size: Height 10.625", Width 8", Depth 5"
Clocks for sale at The Clock Depot including the 635-178 at discount prices.